An outtake from the shoot with Jim Henkens for my book, Oysters, these being grilled on a Lummi Island beach. There are so, so many delicious things to toss on the grill this time of year. Burgers, salmon, corn, steak, ribs, hot dogs, pizza, shrimp, chicken, sausages and countless types of vegetables….as just a starting point. It’s understandable that oysters aren’t top of mind when summer prompts us to make the most of cooking outside. But it’s a shame, because cooking oysters on the grill is one of my top three favorite ways to enjoy them (the other two being pan-fried and slurped au naturel). I actively encourage more folks to hit the grill with oysters. The simplicity of this technique–oysters and a heat source, that’s all you need–makes it a method adaptable to many settings, whether backyard, patio, boat deck, RV park, campsite or beach. 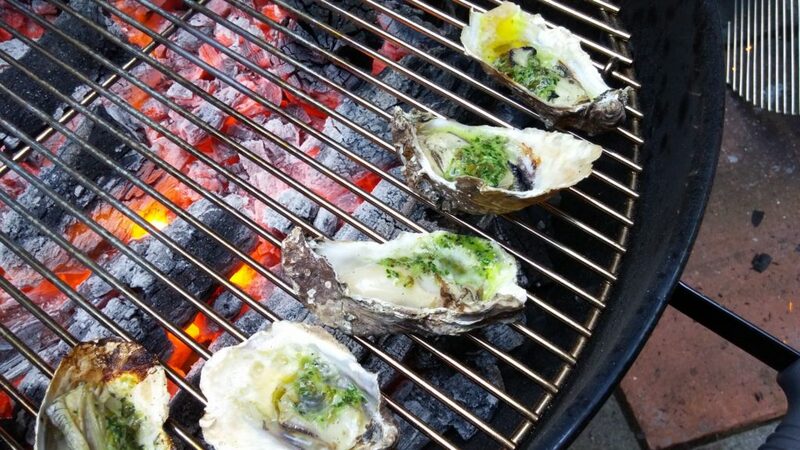 The potential for portability offers the opportunity for a supreme bonus: instead of bringing oysters to your grill, take your grill to the oysters. Scope out a grilling spot near an oyster farm, pick up a few dozen direct from the source and enjoy grilled oysters at their freshest. Lyf Gildersleeve, owner of Portland’s Flying Fish Company, recommends heading to Netarts Bay where you can buy some oysters direct from Nevør Shellfish and take them to nearby Cape Lookout State Park to cook on day-use grills available there. 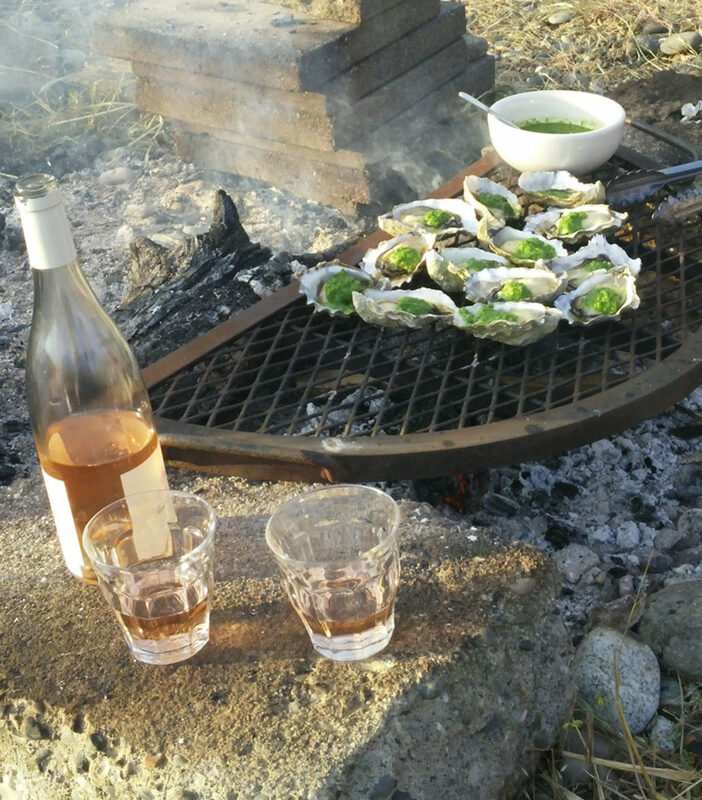 Or, he adds, further south another option is procuring at the Oregon Oyster Farm near Newport and setting up your travel grill in a scenic spot there along Yaquina Bay. 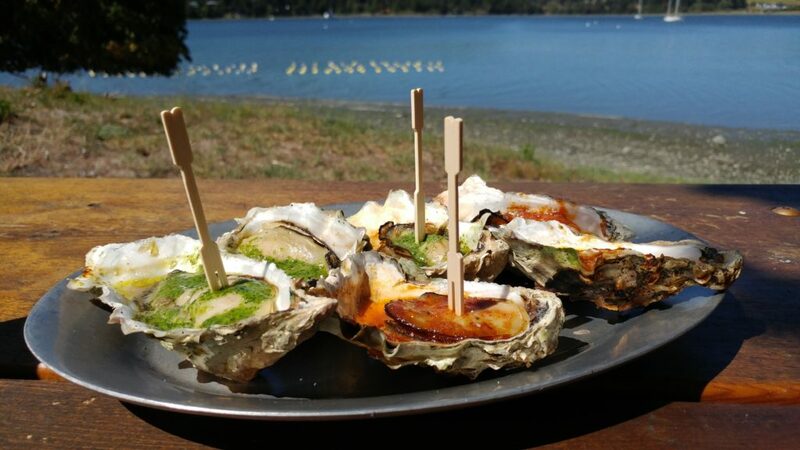 A San Juan Island sampling of grilled oysters at Westcott Bay Shellfish. A few spots on the Pacific coast that I’ve been to don’t require you to tote your own grill along. 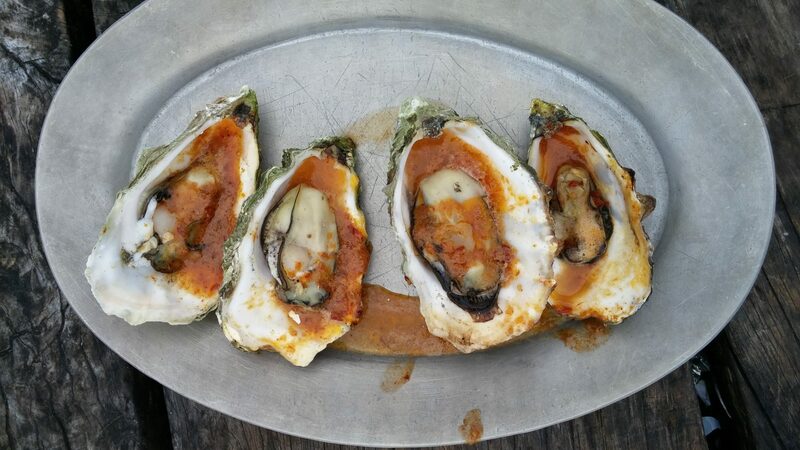 Hog Island Oysters has a particularly stellar spot on Tomales Bay north of San Francisco, with grill-enhanced picnic tables you can reserve for an amazing bayside feast. It was serene (and a touch damp and cool) the December day I visited doing research for Oysters, I’m sure bustling any time the weather’s fine. Grill them yourself, or opt instead for some they’ve grilled at The Boat Oyster Bar, which has cheese, wine, charcuterie and other treats as well. Up here in Washington, three spots of note. First, a quick detour from the beautiful Chuckanut Drive north of Bow is a Taylor Shellfish facility on Samish Bay with retail sales, picnic tables and grills–first come, first served. Over on the Hood Canal, Hama Hama Oyster Company is a must-visit for oyster lovers. 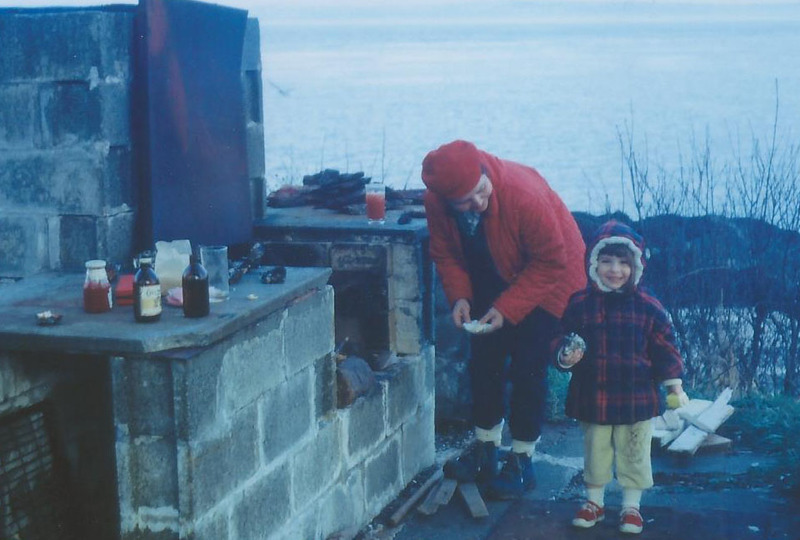 To match the pace of demand, they roast oysters at the Oyster Saloon rather than grilling them, an ideal option when weather or space make grilling tough (see below). And on San Juan Island a couple summers ago, we paid a visit to Westcott Bay Shellfish where they were grilling like mad for a slew of oyster lovers like ourselves. And, as usual, the setting was gorgeous. Oyster territory is, by its very nature, striking. Me on some Puget Sound beach holding an oysters that will momentarily be going on that grill. Freshly home from a trip to Portland last week for a segment on KATU Afternoon Live, during which I did my best to tout grilled oysters in the grill-free zone of a television studio — I thought I’d take a moment to recap some basics for grilling oysters. First off, you have a choice: grill the oysters whole, as is, or shuck them before grilling. The big ‘pro’ for whole is that nothing, beyond a quick rinse in cold water, needs to be done ahead. Just set the lovely bivalves cupped-side down over the heat; as steam builds up with the juices heating inside, the top shell should pop open. Not all do, so there may be a bit of shucking needed to get at the plump meat; for others, the popped top shell comes off easily. On the ‘con’ side is risk of overcooking because you can’t see what’s going on inside. (See more about time below.) This option celebrates the oyster in its purest and most rustic, timeless form. For a bit of finesse, many grillers opt for the shucked version. It requires more advance work, shucking the oysters ahead. But then the work’s all done, and the oysters are ready to serve right off the grill. Plus, adding a spoonful of your chosen sauce/flavored butter/etc. to the raw oyster before grilling allows the flavors to mingle while they cook. And with no top shell, it’s easy to see when the edges of the oyster curl and juices are bubbling around the edge, indicating they’re ready to go. Take care with the long-handled tongs or grill glove to keep as much of those delicious juices in the shell as possible while in transit to a serving platter. ⇒ Save small, deeply-cupped, tumbled oysters for slurping, for a few reasons: the delicacy and distinct characteristics of these prime oysters will be lost once cooked; they tend to be more expensive than larger, ideal-for-cooking oysters; and small oysters risk shrinking and drying out more on the direct heat of a grill. Plus, small oysters are harder to manage on the surface of a grill grate. Opt instead for larger oysters, at least 3 inches long–though some get up to 6 inches or more. Definitely into cooked, knife-and-fork territory. ⇒ Grilling oysters is more art than science, especially if grilling them unshucked. With shucked oysters, you have full insight to the progress, the plumping and bubbling are visible. Time until ‘done’ for whole oysters is less obvious. It will take longer for heat to penetrate heavy, thickly-shelled oysters than it will others, so time can range from a few minutes to 10 minutes or more. Ideally, the top shell will pop open (sometimes just a hair, other times more), indication to remove them from the grill. Which should also indicate nearby oysters of about the same size should be ready soon too; if shells don’t pop, you can pull them from the grill and use a shucking knife to remove the top shell. There is little concern about undercooked oysters, since they’re consumed raw as well. As long as the oyster was in good shape going on the grill (shell tightly closed, it should sound solid–like a rock–when knocked against another oyster), it’ll be good to eat whether the lid pops or not during cooking. ⇒ When grilling isn’t possible or practical, oven roasting will do just fine. I usually go with a temp at around 425F, nice and hot but not blazing. Use a rimmed baking sheet, or some other broad, shallow pan. And to help hold those never-quite-flat-on-the-bottom shells in place, preserving a maximum of juices in the shell, add a 1-inch layer of rock salt or lightly crumple a large piece of foil (about twice the length of the pan) to put in the bottom. When arranging oysters in the pan, press them gently into the salt or foil to sit securely. Same goes for grilling in terms of cooking times, when they’re done. Direct or I direct heat on Grill? I like to use direct heat in the medium-high range, not too hot. If larger oysters that aren’t opening in 8 to 10 minutes, it is good to move them toward the edge so they can finish over lower heat to avoid drying out too much. But don’t need a full indirect set-up.